What Is CityVille, Other Than The Next FarmVille? The people who make the games you either love or love to hate on Facebook have a new one coming out in a few weeks. It's called CityVille, which looks like Sim City without the tornadoes or FarmVille with skyscrapers. We haven't played the game yet, but we can show you video of it in action and rattle off some of the official details shared by Zynga, the folks behind these games. There's a fair amount of the classic Sim City in this and probably a bit of the popular Facebook game Social City, which already has five million monthly users. You're a city planner, starting with a plot of land and the ability to construct buildings on it. Zynga lists houses, post offices, fire departments, schools, restaurants and shops with the goal of making money. They don't mention crime or wretched subway service, so it's not clear what the CityVille equivalent of dying crops or FrontierVille varmints will be. Civil unrest, perhaps? The darkest event Zynga warns against in a press release today is the "stomach rumbling" of hungry citizens. Food is key, a carry-over from FarmVille and FrontierVille. You can have a farm, plant crops or import "goods" (food?) from Shanghai, London and Rome. 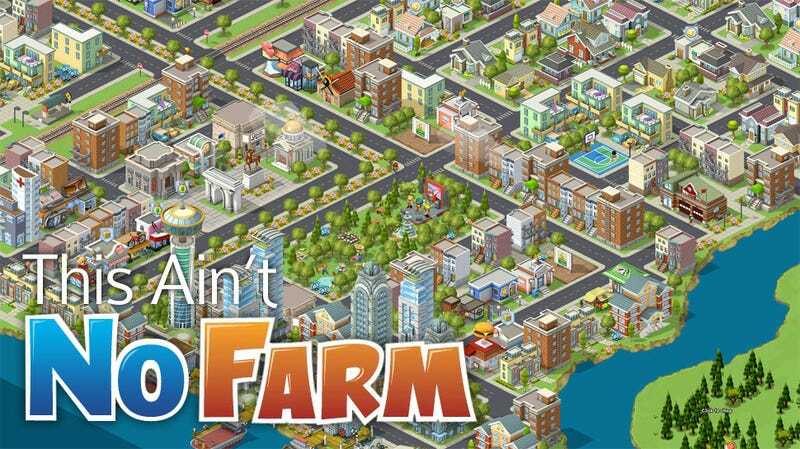 The game's creators are pushing a few changes to the FarmVille formula. Players can manually expand their plot of land. They can also start and run franchises of their business in their friends' cities. Gamers can still team up in what seems like standard Ville-game fashion, helping friends or requesting help from them to trade goods, finish making key buildings or clear land. Zynga hasn't said how any of this social networking will differ, if at all, from the way it works in FarmVille and FontierVille, whether it's more complex, less annoying or what. We've asked and will let you know what they say. Update: Zynga says CityVille status updates will function the same way those do in the company's other games. So, players, be judicious! The cities expand and upgrade of course, which is the main hook. The more you play the more building options you get, the more goods you can obtain and so on. The better you do, the taller your headquarters. The game will be available on Facebook, accessible through CityVille.com, "in the coming weeks" around the world, in English, French, Italian, German and Spanish. Here's a hype video from Zynga which explains CityVille and the company's tolerance for bringing dogs into their workplace. See? They're people too. People who sometimes drink out of Zynga-branded water bottles.